(Pronounced ‘Millochki’ which translates as - The Dear Ones / The Sweeties ! Meets in Croydon, London at least one Sunday a month for all day rehearsals. 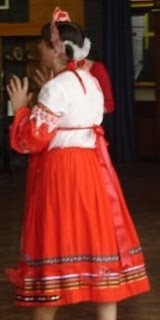 We are an emerging group of local enthusiasts who love to share our joy of performing mainly Russian dance. 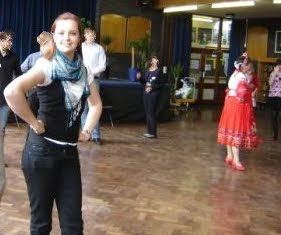 Our repertoire is based on a range of adaptations from traditional Russian circle dances with song to performances choreographed for the stage using authentic music on CDs & tapes. 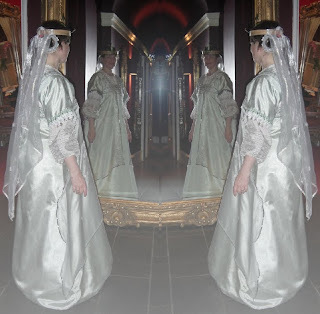 Our programmes combine a variety of styles and moods reflecting the experiences of daily life in different regions and use costumes inspired by old photos & museum pieces. 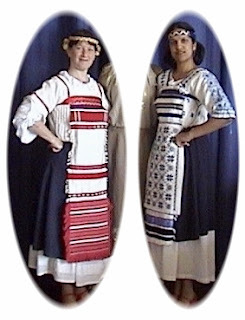 We believe that Folk Dancing is for FOLK, that’s Everyone ! Any age, any size, even those with 2 left (or right) feet ! There’s always a dance that can be choreographed to your talents & includes the bits you like ! We love understanding, studying & preserving the origins of dances, but we also enjoy being creative, applying & combining what we have learnt from our teachers & advisors in Russia, Europe & UK and continuing the evolution of dance in today’s Global Village. A big, 'Thank You' to our principal teacher & inspiration Hennie Konings and to the traditional music groups which his charity sponsors & whose CDs we use & also to our wonderful teacher in Russia, Nataliya Alexandrovna & her group 'Souvenir'. We are always happy to have people come & try out whether they would like to join the group or not, but in the end our love is to share the dances by performing & / or giving workshops so anyone who decides to join needs to be a regular attender of classes & rehearsals. At present we meet in the London Borough of Croydon at least two all-day Sundays a month (lunch provided). Costs (hall hire etc) are divided between the members of the group. Even Bread, Cakes, Russian Salads etc. If you continue down this Blog page you can see some examples of what we do.
' ... thanks for giving us such great workshops. Everyone really enjoyed the experience. You explained everything beautifully regarding the traditions and dances, which is quite amazing for a non-Russian person.When you see Hennie Konings next time please mention your trip to the Highlands and thank him from me for recommending you personally ... and hopefully we will see you again in the future. We started these because there are lots of places where there are English Barn Dances or Scottish Ceilidhs etc, but nowhere where one could try Russian dancing for fun. 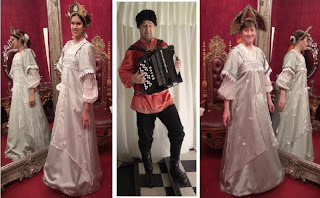 Our Russian Ceilidhs include short performances, workshops, light refreshment & when possible performances by Serge the Music Man with his wonderful Russian songs, accordion pieces and insights into Russian life. 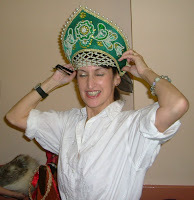 The inspiration for this dance was a song called Viun (Вьюн) which is traditionally danced to at weddings. Viun means Convolvulus, various types being Bindweed & Morning Glory. We felt that such stunningly beautiful music & flowers deserved something more than the simple walking dance of interweaving chains ………. & so our dance blossomed. Do the chains of Bindweed bind the couple together ? Sadly, not in the song, but only in the dance ! ……… Indeed, beautiful as the flowers are, it can be a much hated weed, but we hope that our dance will change the way that you look at it. This dance tries to include many of the dance techniques used in village dances related to the work of plaiting, weaving & sewing as well as the patterns from dances which represent the movements of the sun, stars & planets & the continuous gliding of the dances for which Russians are so famous, related to the flowing of rivers & the waving of trees, we have also included some whirlpools & water-wheels. Traditionally these dances are danced by large groups, but we are only two in our village so the challenge was to see if we could design a dance which would demonstrate the techniques with only two people. It has also been inspired by the sometimes sparkling & sometimes misty rivers & reeds I was taken to in and around Yaroslavl & Kostroma & I thank all those friends who gave me such beautiful experiences, this is a, ‘Thank You’ to all of them, our teachers & their groups. The costumes are also influenced by the fast disappearing village houses, particularly those of Tutayev. One headdress is made of woven Russian Birch bark from Kostroma & the other from English Lime bark, both are decorated with reeds. The veils represent the river mists & the sarafans the colour of the reeds & my favourite Tutayev village houses. Well we can’t tell you the whole story of what happened on the little bridge in our village, but here are some clues ! Cossacks were superb horse-riders and soldiers, many of their dances helped to train muscles which would be needed for horse-riding, marching etc. These dances would often be done with people standing around clapping & watching while individuals competed and showed off their skills in the middle (much as in the break-dancing and street dancing of today). Both men and women would have been able to ride horses and consequently they danced with very strong, straight backs. 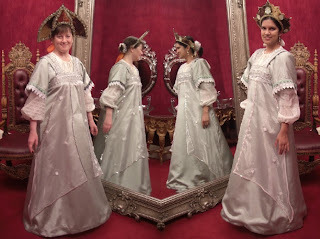 They would have been proud to show off their dress and skills as they danced or rode around. 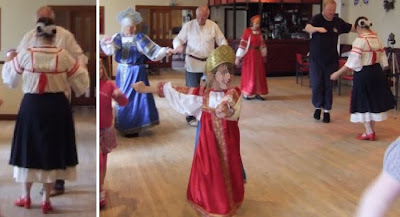 Our expert teacher Hennie Konings choreographed a circle dance, which we love, using the typical Cossack steps and we have adapted this dance for our performances. There is a wonderful painting by Polish artist W. Szerner of a "Cossack Woman on Horseback" showing a Cossack woman hand-spinning flax for linen cloth, shirts etc & riding a horse at the same time, very practical, no time-wasting. There is another dance performed by one of the famous traditional Russian folkdance companies which includes the hand movements used in spinning so in one chorus of our version of Ichali Kozachenki we have combined these spinning hand movements with the horse-riding footwork of Ichali Kozachenki. See if you can spot the horse-riding, marching, spinning & showing off. Quadrilles were originally from France, they were danced by 4 pairs representing 4 teams of cavalry horsemen which were known as quadrilles. 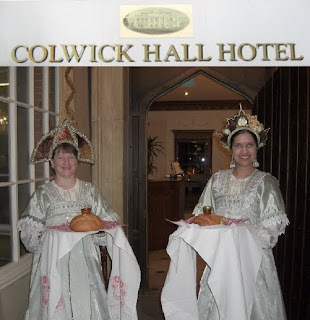 We are only two in our village ie one pair so perhaps we should have called our dance a Unidrille ! 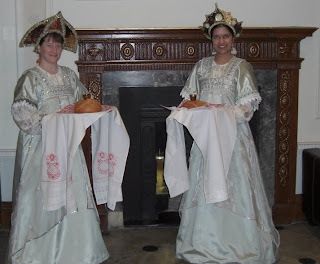 Quadrilles were danced in the French Court and so also became very fashionable in the Russian Court. There are verses in this dance which are linked to the Russian Orthodox wedding ceremonies, carrying a candle, going through / under the arches of the church and promenading round the Church. During the pre-lent time of year known as Maslenitsa(Ru) / Mardi Gras (Fr)/ Shrove Tuesday(Eng) great festivities would take place in Russia, as in many other countries, and groups of villagers / gypsies etc would go round from house to house entertaining the parties of noble folk with a polka or quadrille in each house in the hopes of earning a meal or a few coins for their families. Our Kadril is an adapted version of the Kadril taught to us by my teacher in Russia, Nataliya Alexandrovna, we have tried to retain elements of all the above themes, but it's a slightly humorous version based on the idea of a couple of village children watching & mimicking what they see going on at a ball in a noble household.